Market animals to be sold under the grass-fed standards shall be 100% grass fed for and under NCM member ownership for at least 6 months prior to slaughter (no feed lots). No hormones shall be used in production. 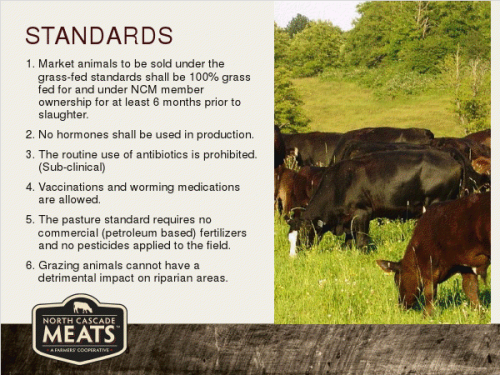 The pasture standard requires no application of petroleum based fertilizers and no pesticides. Farm Members selling their animals to North Cascades Meat Producers Cooperative for the North Cascade Meats™ branded program will be required to meet all of the standards above. The community will have access to this beef through local grocers, restaurants and institutions that support the program.